Hey there, folks! It’s October, it’s a Monday, and it’s been awhile. Today I want to share something that’s been on my heart more often than not the past several weeks–along with the world’s most exciting update about Alpha Gam’s brand new chapter in Chattanooga, Tennessee! It’s been a busy few months and I couldn’t be more grateful (or tired). Life is happening so fast and it’s unbelievable how much can take place in the span of just weeks. But let’s be honest–who doesn’t fall victim to this kind of self-talk? How often have you pulled up your Instagram feed on a Sunday afternoon and scrolled through dozens of brightly colored photos of friends (many of whom you barely know) having what looks like the time of their lives in the most beautiful places? Comparison is a trap that pulls us in unsuspectingly and entangles us before we have a chance to run the other way. I think we often see other people’s lives through rose-colored glasses without taking a step back to remember that things are not always as they seem. We present these glossy exteriors to the world while hiding our mess right along with the coffee stains on our sweaters. I guess my point here is that I’m working to shift this paradigm that tells me I should be meeting everyone else’s expectations. The truth is that we’re all just trying to make it in this world, in whatever random or hectic or #glam (not at all) way that we can. And if you’re ever sitting around wondering when in the world you’re going to measure up, know that you are certainly not the only one, and that timing has a tendency to work wonders if we surrender our need to control every little detail. Hang in there. But now for my other news! This is what you actually wanted to hear, right? 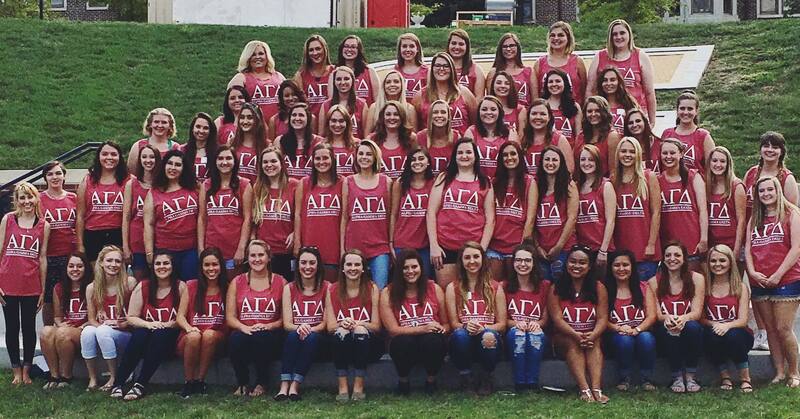 After a busy month of extension at the University of Tennessee at Chattanooga, Alpha Gamma Delta has a brand new chapter of over 70 women who are already proving to be leaders on their campus and in the Fraternity. Extension can be a strange experience because you work diligently for weeks to create something that doesn’t exist at all yet. It’s easy to wonder how on earth the whole thing is ever going to come together and then panic and retreat to Starbucks because it all just seems too overwhelming. (Speaking from personal experience? Absolutely.) But the best feeling in the world is seeing women whom you and your coworkers have met on campus take the leap and join an organization that will change their lives. They’re getting to create something brand new that will be around for decades or even centuries. How mind-blowing is that? Today’s reminder: I appreciate you always (yes, YOU!) and am thankful to get to share experiences and stories with the people who matter the most. Happy October–have a wonderful few weeks and give yourself some space to be imperfect! Goodness knows the world needs more of that.